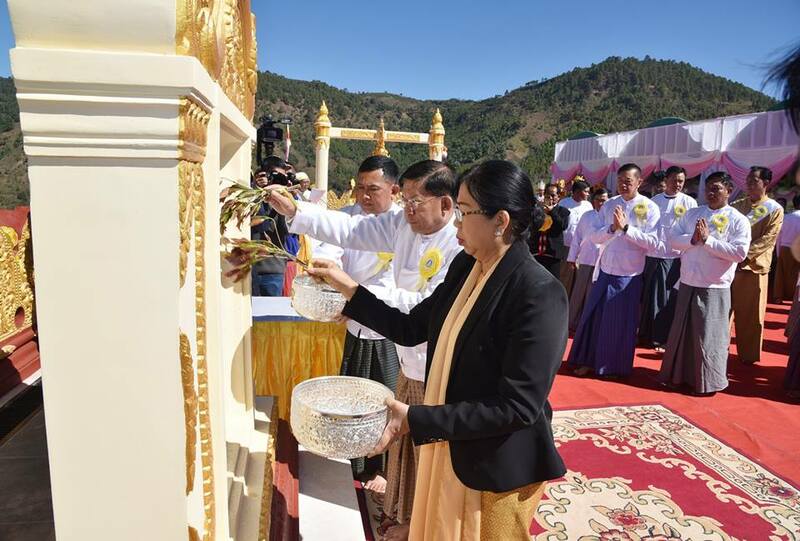 A ceremony to enshrine religious objects donated by families of the Tatmadaw (Army, Navy and Air) into the original, middle and upper reliquaries of Abhayarazamuni Buddha Image near Pankwe Village, Kengtung, took place in conjunction with a consecration ceremony of the Buddha Image this morning. Present on the occasion were Kengyin Monastery Sayadaw Agga Maha Saddhamma Jotikadhaja Bhaddanta Khemacara, Naga nakaung Monastery Sayadaw State Ovadacariya Abhidhaja Agga Maha Saddhammajotika Agga Maha Pandita Bhaddanta Dhammasiri, State Sangha Maha Nayaka Committee Vice Chairman Loilem Sayadaw Agga Maha Pandita Agga Maha Saddhamma Jotikadhaja Dr Bhaddanta Pannananda, Muse Laitainkham Monastery Sayadaw Maha Kammathanacariya Bhaddanta Sukhaminda and 108 members of the Sangha, Commander-in-Chief of Defence Services Senior General Min Aung Hlaing and wife Daw Kyu Kyu Hla, Commander-in-Chief (Navy) Admiral Tin Aung San, Commander-in-Chief (Air) General Maung Maung Kyaw, senior military officers of the Office of the Commander-in-Chief (Army), the commander of Triangle Region Command, departmental officials, donors, invited guests and local people. 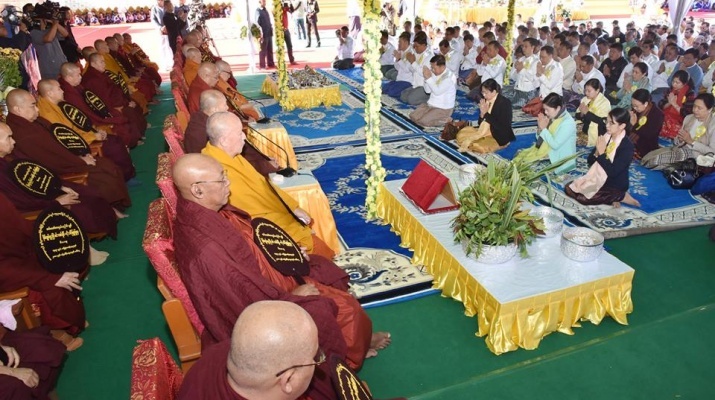 First, the Senior General and congregation received the Nine Precepts from Loilem Sayadaw Agga Maha Pandita Agga Maha Saddhamma Jotikadhaja Dr Bhaddanta Pannananda. Dedicating to Lord Buddha, the Senior General and wife offered the religious objects to be enshrined into the reliquaries to Kengyin Monastery Sayadaw Agga Maha Saddhamma Jotikadhaja Bhaddanta Khemacara and donated alms. Next, the Commander-in-Chief (Navy) and wife, the Commander-in-Chief (Air) and wife, senior military officers of the Office of the Commander-in-Chief (Army) and those in attendance presented offertories to the Sayadaws and members of the Sangha. 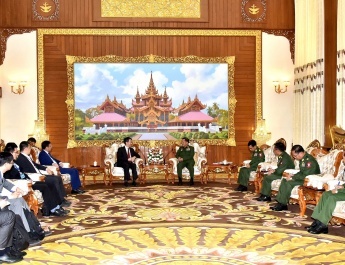 Then, Director of Directorate of Military Engineers Maj-Gen Maung Maung Myint reported on facts about the Abhayarazamuni Buddha Image. Muse Laitainkham Monastery Sayadaw Maha Kammathanacariya Bhaddanta Sukhaminda delivered a sermon with the congregation sharing merits gained. 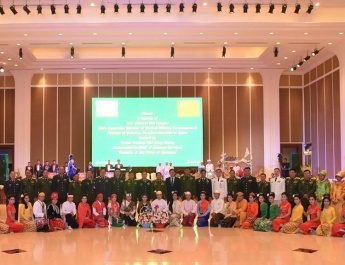 The Senior General presented cash awards to Myanmar handicraft expert Professor U Zaw Than Htut of Mandalay National University of Arts and Culture, stone sculptor U Kyaw Kyaw Lwin and Myanmar handicraft expert U Sa Win Kyi, who participated in the pagoda construction. Next, the director of Directorate of Military Engineers presented the replica of Abhayarazamuni Buddha Image to the Senior General. The Senior General, wife and party flanked by people in royal costumes conveyed the religious objects on a grand scale and went round the Buddha Image clockwise. Then, the Sayadaws, the Senior General and party kept the religious objects into the respective reliquaries. Members of the Sangha consecrated Abhayarazamuni Buddha Image. 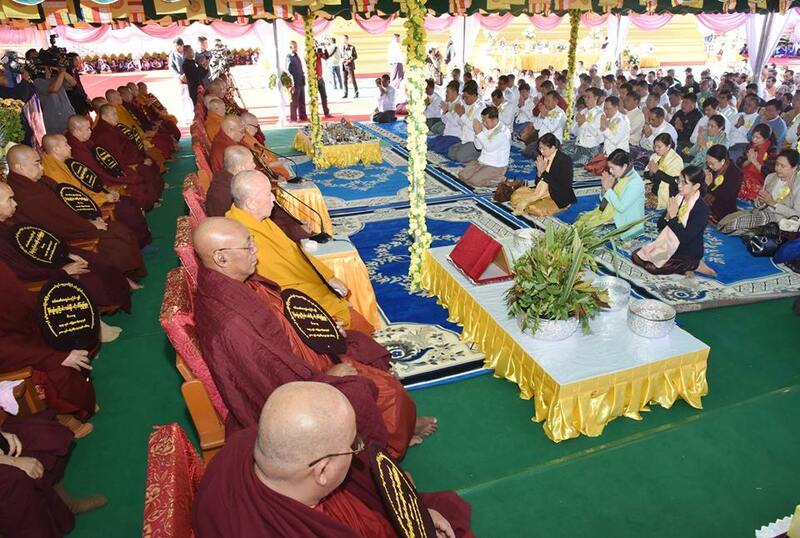 The Senior General and wife performed the rituals of golden and silver showers in commemoration of the successful completion of the enshrinement ceremony and offered the alms in emerald alms-bowl, fruits, flowers, water and oil lights to the Buddha Image. The Senior General and wife opened and sprinkled scented water on the stone plaque, the peace, prosperity and development bell and the banner post. And, they beat the bell nine times. The Senior General, wife and party offered alms to members of the Sangha. Construction of the Buddha Image started on 6 October 2016 with collective donations of families of Tatmadaw (Army, Navy and Air) and well-wisher people led by Senior General Min Aung Hlaing and wife Daw Kyu Kyu Hla with the design on Abhaya Mudra of showing peaceful posture created by Professor U Zaw Than Htut of Mandalay National University of Arts and Culture and the Directorate of Military Engineers under the close supervision of Abbot of Thiladhamma Kontha Monastery Wasipaik Sayadaw Bhaddanta Kovida in line with the advice of Chairman of State Sangha Maha Nayaka Committee Bhamo Monastery of Mandalay Abhidhaja Maha Rattha Guru Abhidhaja Agga Maha Saddhammajotika Dr Bhaddanta Kumarabhivamsa, Rector of Yangon International Theravada Buddhist Missionary University Sayadaw Dr Bhaddanta andamalabhivamsa and Sayadaws from eastern Shan State. The Buddha Image is located in the compound of Buddha Park near Pankwe Village, 15 miles from Kengtung, eastern Shan State. 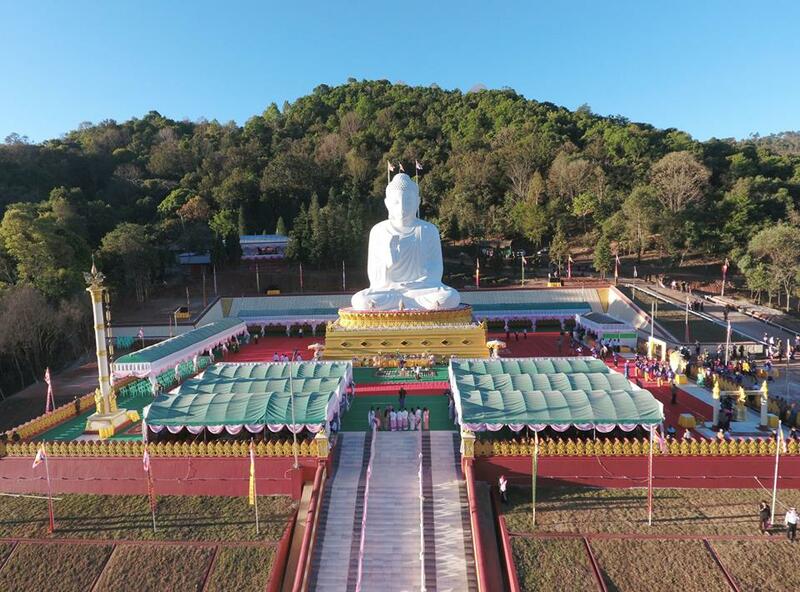 Construction of the Buddha Image aims to flourish Buddha Sasana in eastern Shan State, ensure peace and prosperity and develop the local economy due to visits of local and foreign tourists to the Buddha Image. The 54 feet high Buddha Image is kept on 18 feet high throne which is located in 180 feet long and 150 feet wide platform. Paintings on Buddhology are carved on marble slabs at the throne. The floor inside the image is placed with tile parquets where devotees can take meditation, and the windows are installed with steel structures. The peace, prosperity and development bell is cast with the use of about 600 viss of bronze, with inscriptions on Metta Sutta. At present, people may pay visit to the magnificent Abhayarazamuni Buddha Image.